Everywhere I turn, places are named. My local hockey arena, thanks Xcel. My baseball stadium, thanks Target. Corporate support can add a lot to a community. Does it make me feel warm and fuzzy about the corporation? Not really. Does it better position the corporation in my mind’s eye? Not usually. Do I understand what they do because of who they sponsor? Rarely. Do I know the sponsor better? Almost never. Sometimes…Sponsorships work AND makes sense. 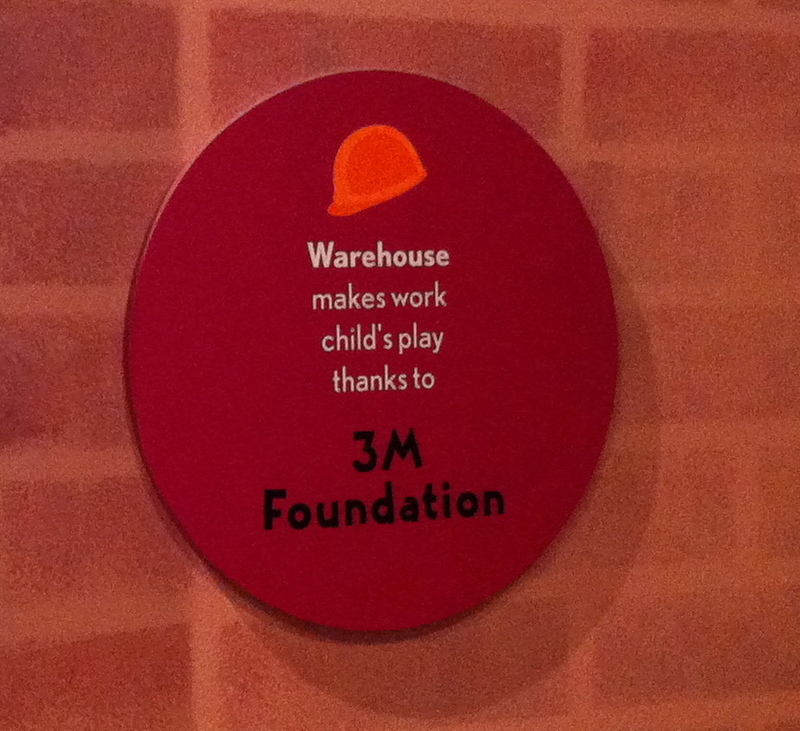 The manufacturing plant at my children’s museum is sponsored by 3M. This little plaque is seen by hundreds of parents every day as they play warehouse with their kids — moving blocks on hand-turned conveyor belts, moving blocks to the shipping center, shouting orders from floor to floor. Who is 3M? Minnesota Mining and Manufacturing. They’re big, they’re local, they’re philanthropic. They make stuff and ship it around the world–just like my little people in the Warehouse at the Minnesota Children’s Museum. More importantly do I know them better because of this? do I like them more? do I think they’re pretty shrewd marketers? Do sponsorships work for you? I am a 3Mer that frequents the Children’s Museum often. We have had a membership for many years. The manufacturing plant is my kids’ favorite thing to do at the museum. I personally am amazed when I sit and watch all the kids work together moving those blocks and how serious they get in their roles. When my kids see those 3M sponsorship plaques posted around the museum they always say “Mom, there is 3M.” Those signs make me proud to be a 3Mer. I am grateful that the company I work for has donated the funding to help make the Children’s Museum one of the greatest places in the Twin Cities.